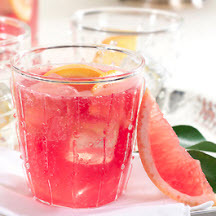 Recipe courtesy of TexaSweet Citrus Marketing, Inc.
Stir together Rio Star Grapefruit juice and pomegranate juice in a large pitcher. Chill at least 2 hours or up to 24 hours. Stir ginger ale and orange slices into the grapefruit-pomegranate mixture, and serve immediately. Makes about 18 (1/2 cup ) servings. Recipe and photograph courtesy of TexaSweet Citrus Marketing, Inc.